In my project , I need to interface a pmod wifi module to FPGA(Zed board) ,for this I used IP Catalog but I am getting some errors . I attached the block diagram of my design . Can anyone help me in ? Here is a forum thread deals with getting the Pmod WIFI working with the Zedboard. This forum thread should help you get your project working. Thank you for providing the information .I followed the same as it was mentioned in the thread.But I got errors while generating bitstream.I am completely new to this field and I am unable to crack those errors.I attached the screenshot .The version of vivado I am using is 2016.1.Please let me know where I did the mistake. The errors are dealing with the constraints. Please attach a screen shot of the vivado project settings and the ip repository( where you added the vivado library). 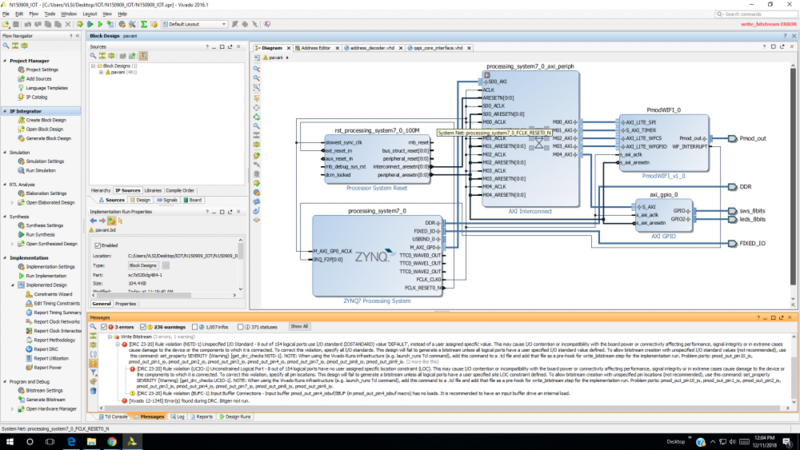 If you are able to use a different version of vivado we posted a working project of the forum thread here using Vivado 2017.4 with the Pmod WIFI and the Zedboard. Thank you for the information. As you have suggested, I have a problem with my vivado library files after changing them I got my bitstream . Though I generated my bitstream I don't know why we kept those blocks in the block design. I am completely new to this field . So can you provide any information regarding that ? Here is a YouTube video tutorial on using the Pmod WIFI. It uses an Artix-7 development board so the specifics are different but the overall process will be the same. 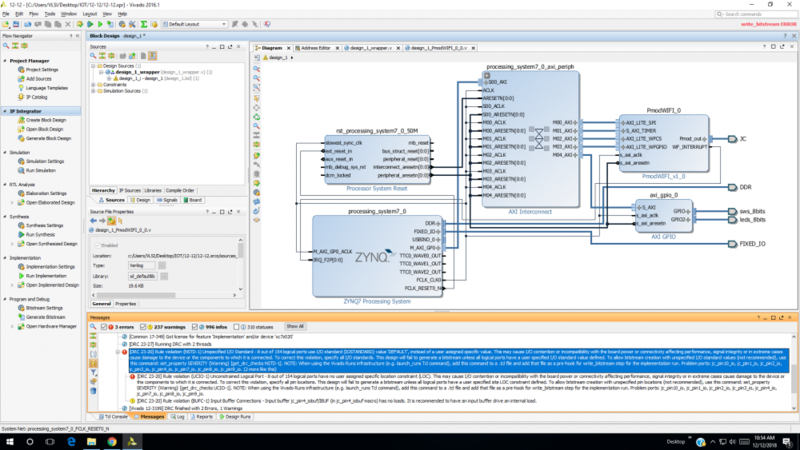 Here is the zedboard getting started with zynq tutorial that should be helpful with getting to know the ZYNQ processor. The AXI GPIO is used with this specific example. 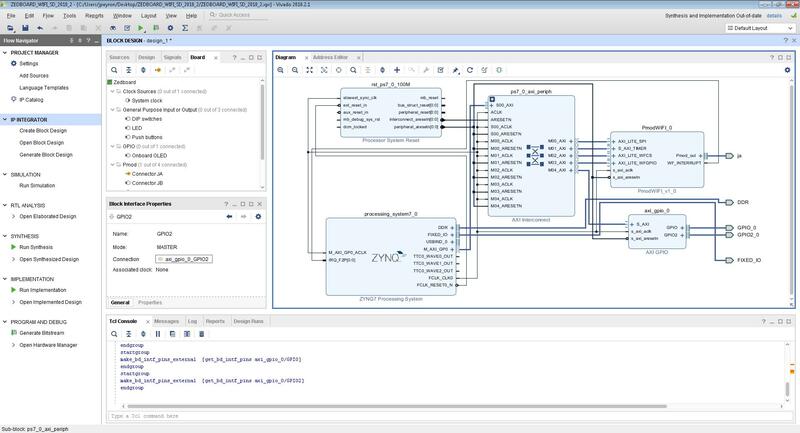 When connecting additional IP Cores through the axi bus to the zynq/microblaze processors vivado adds the axi interconnect and axi processor system reset. I am implementing home automation on fpga (zedboard) .We want to control the home appliances through wifi like controlling the speed of fan and lights on/off using pmod wifi. Till now I competed the block design as you had done in the forum and I need information about how to interface the all the to fpga board .Can you provide me all this information? Could you be more specific about your project? Are you trying to control previously enabled WIFI home appliances like this Light bulb or power outlet with the zedboard/pmod wifi? Or are you planning on enabling WIFI into these type of appliances and then control them using the zedboard/pmod WIFI. I have not designed either type of project so I do not know how helpful I will be. I would like to interface a small motor(in place of fan),an led (in place of electric bulb) to fpga .We would like to control the speed of fan and light through wifi by interfacing pmod wifi to zedboard.For user intreface,we have to built some android application to conterol the speed of light wireless. To clarify the led and small motor will be physically connected to the Zedboard. The android application will connect the zedboard to a smartphone through wifi. It should also control the small motor and led. If this is the case then you should be able to alter the HTTP server to interact with the small motor and led instead of the switches and on-board leds. Can you provide any information regarding the alternation of HTTP server as you have suggested above?? Thanks for the information that you have provided. I,successfully,generated the Bitstream. How can I continue further?Do I need to interface the relay module to control the light and motor? Yes, you would need to then add some external circuitry connected to the two GPIO pins in order to make the motor and LED work. I would strongly recommend using a transistor to control the motor as the pin from the FPGA will not not provide enough wattage (both in voltage and current) to successfully drive the motor. You will also likely need some sort of external power source to power the motor in general. 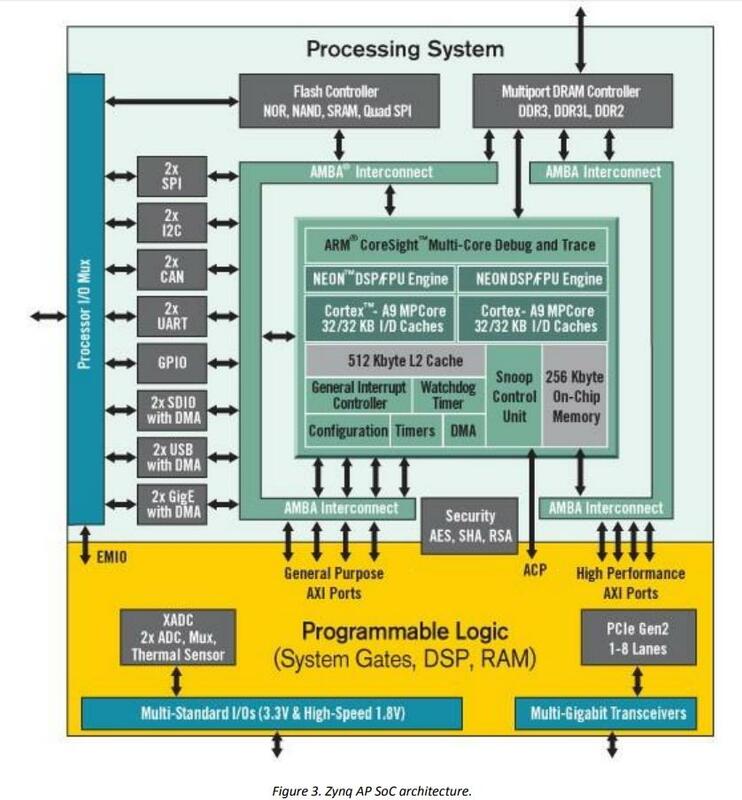 In terms of driving the motor, you will probably want to use PWM (perhaps through the AXI timer IP from Xilinx) or a similar technique to control the FPGA pin that will then "turn on" the transistor at appropriate intervals to make your motor run at the desired speed. If you are wanting to drive the motor both directions, you will also need to implement an external H-Bridge and add an additional GPIO signal to gain the required secondary input for that setup. Thank you for your information. Could you please guide me to interface the relay module to my Zedboard ?. I could not find any information regarding that...Can I use the add-on cart(HUIGANG-HRS2H-S-DC5V-N) for this purpose? You could use that module. The way I would probably set up such a system would be to put the relay on it's own separate board (such as a breadboard) and connect jumper/fly wires from the Zedboard to the relay board and on the outputs of the relay use wires to connect to your light and motor as appropriate. An example of how this connection might generically look can be found on one of the images in step 10 of this Instructable.